Tips & solutions for an organised home! 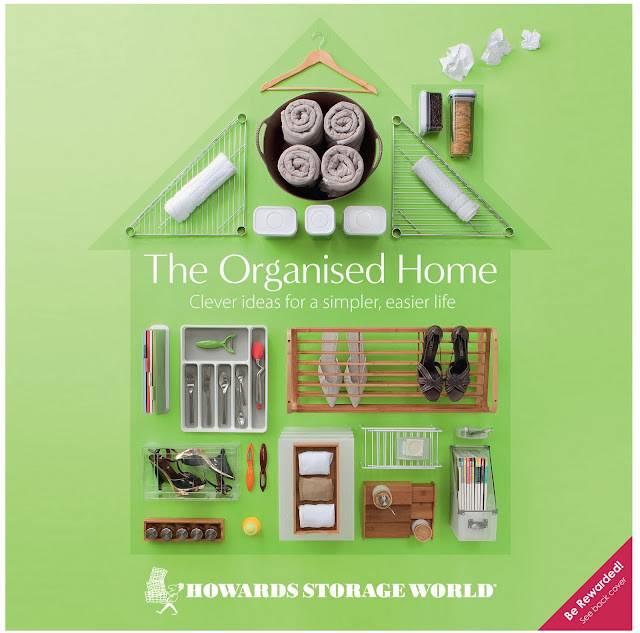 A brand spanking new Howard's Storage World catalogue just hit the stores (and they're free! ), so you officially have no excuse for having a disorganized home! It looks like a nice one, and I've included some great tips for sticking a rocket up your kitchen & bathroom, thanks to the Howard's peeps. And they know their stuff, let's face it! 1. When planning your pantry, create a zone that the kids can easily reach. This should include a shelf or basket where breakfast cereal and healthy snacks are kept. Empowering your kids to serve their own breakfast and choose a healthy lunch is an important step in their learning, and will also save you precious time in the morning. 2. Find goods in your pantry easily by grouping like items such as condiments and packets. Store the groups in quality Linus Bins & Pullz to make it faster to find and avoid grocery double-up. You will save money and time when you can easily see what you have. 3. Label shelves and storage containers so others in the family know where to return/stock pantry goods. 1. Save time by getting the whole family to pre-sort their laundry while sill in the bathroom! Invest in a hamper with separate compartments to divide your whites and colours. The Bamboo Hamper Double is a stylish option. 2. Easily access you makeup by grouping and storing it clear acrylic organisers in the bathroom. This will save you time everyday. 3. Organising your bathroom cupboard? Think in zones. Keep most used items within easy reach in the ‘A grade’ zone at arm level. Above ane below this space store less accessed items. 4. Manage your bathroom inventory better by ensuring everything has a place. Why buy more lotions simply because you can’t find the ones you have? Thanks for posting this, Louise, it totally calls out to my OCD side! OH I can not wait to get in there to pick it up! Actually, I am phoning my local store now and having them send me one. Well i work for howards! and yes, we know our stuff!! come and see us in store, we are always happy to help when and where we can to help declutter and reorganize your home! It's fantastic, isn't it? And hey, if you love buying the products but then don't know what to do with them in your own home, ask a Professional Organiser to help you out! excellent but with pics and video clips, this site could certainly be one of the very best in its niche. make this amazing site yourself? Please reply back as I'm planning to create my own personal website and want to know where you got this from or what the theme is called. Kudos! I'm really loving the theme/design of your weblog. Do you ever run into any browser compatibility problems? A handful of my blog readers have complained about my site not working correctly in Explorer but looks great in Firefox. Do you have any suggestions to help fix this issue? Hey! I'm at work surfing around your blog from my new iphone 3gs! Just wanted to say I love reading your blog and look forward to all your posts! Keep up the excellent work! Hi there all, here every person is sharing these know-how, thus it's good to read this webpage, and I used to pay a visit this webpage everyday. pretty worth enough for me. Personally, if all site owners and bloggers made good content as you did, the web will be a lot more useful than ever before. I'm moderately certain I will be told many new stuff proper here! Best of luck for the next! Just want to say your article is as astonishing. The clearness in your submit is just cool and that i can suppose you're an expert on this subject. Well along with your permission let me to grab your RSS feed to keep up to date with drawing close post. Thanks one million and please continue the rewarding work.